Golfers can never get enough golfing gimmicks and your business will make its mark with these fabulous golf-themed balls. Although they look like real golf balls, and every golfer has enough of those, these are fun and trendy stress balls. They are made from soft-feel material that can be squeezed, bashed and squashed and will always return to its original shape. The design features a classic round golf ball shape in a light colour with the little dimples covering the surface of the ball, making it look just like the real thing. Get your marketing campaign into the big time when you brand your personalised company logo onto these balls. Hand them out at expos, sports occasions, outdoor events and golf days. They make fabulous promotional items. Your clients and future clients are sure to keep them on their work desks, where they will be used when the going gets tough. These balls are ideal for golf-related businesses, selling golf gear and equipment, golf clubs, corporate golfing days and other golf events. 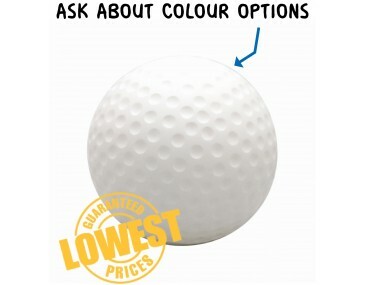 Our listed price includes branding of your logo or graphic in a single colour print onto the ball. Please note that our prices exclude GST and a print set up of $75 applies. This stress golf toy may be personalized with your logo or graphic using additional print colours. The price for additional spot colours onto a single position using pad printing onto stress balls can be viewed on the table below. This golf shaped stress ball toy may also be personalized with your graphic with a full colour finish. We use a method called digital transfer printing onto stress balls to create some realistic branding effects that you will absolutely love. The pricing for a full colour print can be viewed here. Please ask us for a written quote for printing onto stress balls. This product is supplied in bulk quantities. We offer a product turnaround time of two weeks, but we can offer even faster turnaround times for urgent orders. For larger orders ask us about our custom made indent production service.